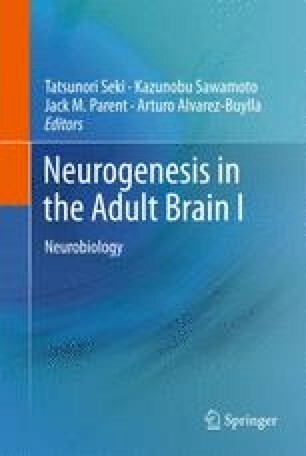 Adult neurogenesis in reptiles is a well-documented phenomenon and exists in many telencephalic areas. The newly generated neurons originate along the walls of the lateral ventricles, mainly in the sulci. The putative neural progenitors are radial glial cells. These glial cells give rise to neuroblasts that migrate to their final destination. In general, the new neurons are born in the portion of the ventricular zone (VZ) adjacent to the telencephalic area where they will be recruited and migrate radially through the brain parenchyma along the processes of radial glial cells to their final destination, although migration to the olfactory bulbs (OB) is different. Specifically, it seems that new neurons of the OB are not produced in the ventricular walls of the OB ventricle, but instead in more caudal levels of the lateral ventricles. They then migrate tangentially over the soma of the VZ radial glia until they reach the OB. Adult neurogenesis creates microneurons and projection neurons, and occasionally there is gliogenesis as well. One last striking feature of the reptilian brain is their ability to regenerate large neuronal populations that have died as a result of physical and chemical injuries. Special thanks to Enrique Font, from the Instituto Cavanilles de Biodiver­sidad y Biologia Evolutiva, and Nader Sanai, MD, at the University of California San Francisco, for their comments and suggestions on the manuscript. This review was supported by CIBERNED and TerCel.